Note: You may have to play around with the font size and paragraph width to get it to display nicely in your post. Note that you can't have hyperlinks, etc., in the post. Also, I forgot to mention you will have to crop the image. On the other hand, if you just want to frighten off potential copy-cats, refer to What to do when your blog content is copied. (Note: This part of the post is done in the normal way, otherwise, it will be impossible to include the link above. Er, if a human can't copy the text, it follows that search engine spiders can't read it and your post most likely won't ever get read. If the post is that noteworthy, it wouldn't be so hard to OCR it, then someone else has your post, and get's it indexed too! You have a valid point. Just shows, if you don't want to be copied, don't put it on the Internet. I have taken so many tips from you,I feel I owe you money. O.K...well maybe not money, but a thanks! Can we really prevent copying. I don't think so when we r using Blogger. Hi Peter That is a good idea but I dod not think it will prevent 'scraping' which was inflicted on my dog's blog. Also if someone like what you have written and wants to highlight the 'blog this' button, you wouldn't want to stop that. Highlighting a portion of the post and putting a link back to the post will be highly welcomed by most bloggers, but not wholesale copying with no acknowledge as had happened in this case. 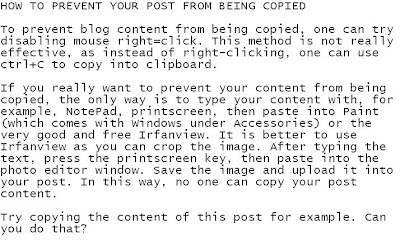 well, the person could just copy your image instead... OR printscreen if you disabled right click. You got a point there. However, the image will not be searchable by search engines. However, it would also be true for the original. You win some, you lose some. Sometimes it just cannot be helped. Hello and thanks for all you great tips! I was hoping you know of a copywriting program that is downloadable, comparable to IrfanView that works with a mac (IrfanView does not)? ?